London has emerged as the ultimate solution to all kinds of hair loss issues. FUE or Follicular Unit Extraction is the procedure offered by an array of reputed clinics in London. It is a treatment in which the unit hair follicles are picked up by the surgeons and graft them to the affected areas. To promote hair growth FUE hair transplant works wonder to make the scalp fertile. FUE hair transplant is a surgical technique that removes follicle units or individual hair, one at a time from the donor harvesting site. It is minimally invasive and involves using small circular punches to remove the individual follicular hair unit from the back of the scalp. The harvested follicular units are then re-implanted into the scalp in the balding recipient areas. The procedure of FUE hair transplant is performed under local anaesthesia. By extracting follicular units out of donor area the surgeons begins the procedure. The grafts are then kept in a holding solution till the time recipient area is prepared. Lastly, the extracted follicles are then implanted to create the hairline as per consultation with the patient. Patient who are below 24 years are not suitable for the procedure. As it is a surgical procedure, one should consult a physician before opting for another treatment simultaneously with this one. The main cause of hair thinning in men is Androgenic Alopecia commonly known as male pattern baldness. FUE hair transplant is suitable for men who are experiencing some degree of hair loss. Similar to men, FUE hair transplant is suitable for women as well. FUE hair transplant is a permanent solution for women who are suffering from hair thinning. If you are dying your hair, dye it 3 days before the procedure. Avoid contact with UV rays by covering your head with hat, etc. Placing the head high while sleeping after the surgery for a few nights. To access the best consultation with expert surgeons London has become one of the most sought after destination. There are many clinics in London that offer free consultation and provide different surgical procedures such as FUE hair transplant that works wonder in acute hair loss problems. 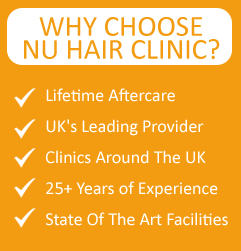 If you are seeking a specialized hair loss treatment then Nu Hair Clinic offers modern treatments for hair loss. Under the guidance of experienced doctors the clinic provide FUE hair transplant to get rid of hair loss.